RaeQuan Battle’s inspirational journey from rez ball rookie to Marysville Pilchuck legend to University of Washington commit continues to demonstrate a seemingly limitless potential on the basketball court. Even with a bright future ahead of him and dreams of making the NBA, the 6-foot-5 human highlight real has never forgotten his roots. Those roots keep him grounded with a rare humility and silent strength that don’t go unnoticed by adults and youth alike. That is just one of the many reasons RaeQuan was named by the Tulalip Boys & Girls Club as Youth of the Year. 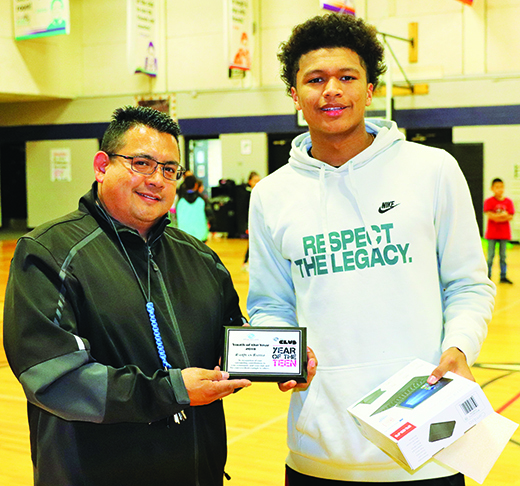 The 18-year-old high school senior was honored with a custom plaque and given some fancy gadgetry, a 2-in-1 Notebook/Tablet, in front of a crowd of his adoring young fans on March 12. For years, the Youth of the Year program has honored and celebrated the Club’s most inspiring teens and their incredible journeys. Stories of outstanding leadership, service, academic excellence and dedication to living a healthy lifestyle have made Youth of the Year a premier leadership and recognition program for teens. These amazing young people represent the voice and spirit of hope for children everywhere, inspiring kids to lead, to succeed, and to inspire. 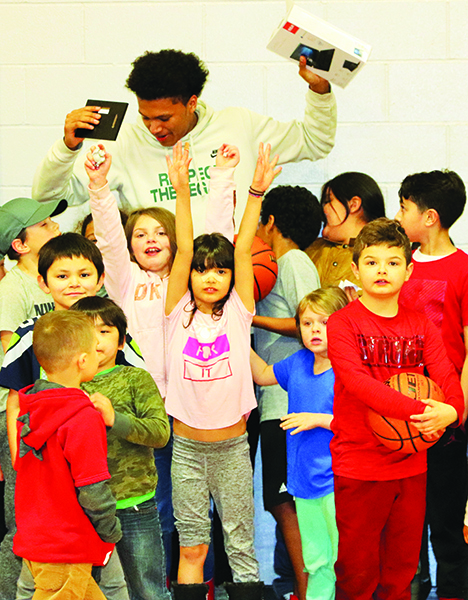 “He was chosen for his volunteering and mentoring with the youth, and for his community service, sportsmanship and demeanor,” added Office Manager Diane Prouty. Each year, one exceptional Club member is selected to be Youth of the Year, serving as an ambassador for Boys & Girls Club youth. Over the years, these individuals have exemplified the Boys & Girls Club mission and are proof to the impact Clubs make in creating life changing opportunities that transform the lives of countless Club kids. (Everett, WA) – Registration for the 21st annual United Way Days of Caring is closing Wed,, Sept. 3. As in past years, there are opportunities to volunteer throughout the county on both Friday, Sept. 12 and Saturday, Sept. 13. Days of Caring is the largest volunteer event in Snohomish County. Although several hundred volunteers have already signed up, volunteers are still needed at more than two dozen projects throughout the county in Mukilteo, Tulalip, Everett, Marysville, Bothell, Stanwood, Lynnwood and Mountlake Terrace. Registration information and project details can be found on United Way’s website www.uwsc.org/docvolunteers.php. The Tulalip Boys and Girls Club needs help repainting the teen center and with spreading bark outside. This Boys and Girls Club provides before and after school programs for youth 5 to 18 years of age, and full day programs during school breaks and summer (Saturday shifts available). Habitat for Humanity in Marysville needs help with a home building project, fence painting, and a dry wall project. Projects in other parts of the county that need volunteers include the Mukilteo Community Garden, Volunteers of America Western Washington Food Bank in Everett, Helping Hands Ministries and the Northshore Senior Center in Bothell, Child Strive, Friends of Youth, YMCA of Snohomish County (Everett location), Smithwright Services in Lynnwood, Low Income Housing Institute in Mountlake Terrace, Full Life Care and Housing Hope still need volunteers as well. Catholic Community Services needs volunteers to help several elderly couples with yard work and basic house cleaning in Stanwood and Everett. In 2013, 1,019 volunteers participated in Days of Caring, offering over 5,600 hours at 47 nonprofit project sites throughout the county. The hashtag for this year’s event is #UWSCDoC.